"My Great Grandfather made mid-century furnishings and he handcrafted a beautiful clock that was kept above their fireplace. I recently visited my Great Grandmother and the house was exactly the same and I remember when I was growing up, and the clock is still in the same spot. When I was young my father made our family clock which chimed, and somehow it kind of became our family symbol. Whenever I visit my parents and I hear the clock chime all kinds of fun family memories come back. I just think that clocks have a beauty all their own and I genuinely love to make them. There is something about taking several unrelated objects and creating a clock that literally comes to life. I guess I took my love of clocks and combined it with my love for beautiful china and thought I could really have fun with it." 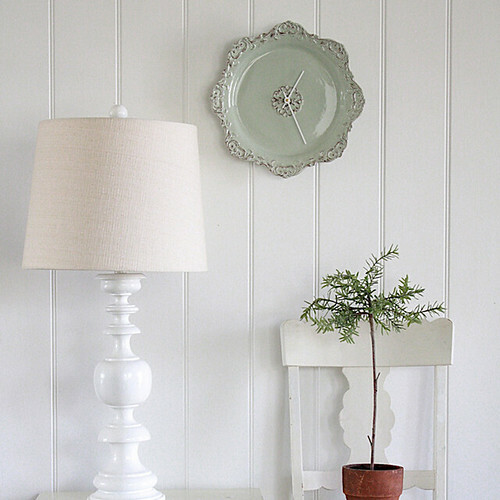 if you're in the need for some inspiration, even jenilyn's styling photos for the clocks are beautiful. 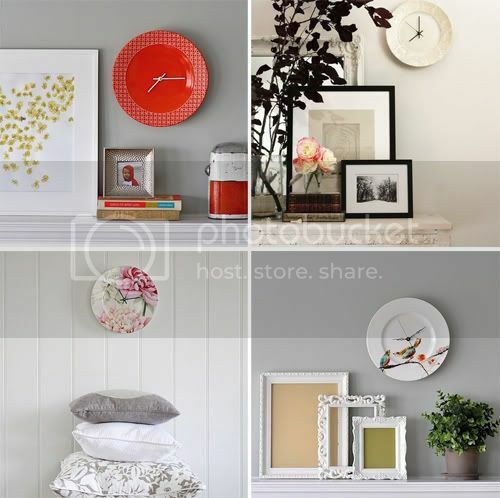 i just imagine so many lovely little corners in her house that make for amazing photos: i want little corners and walls in my home that look like hers ;) just look at some of these photos! or if you need a gift for someone, this would make such a fabulous gift. also see faire houre blog or her flickr for an archive of all the clocks and photos. and treat yourself to one of these special clocks! I LOVE your blog, and would LOVE to collaborate with you on something for it. I'm a conceptual photographer. I don't know which one I would pick either! They're all so cute! You always post pretty designs and inspiring things on your blog! Congrats!! thank you for the link, i saved her shop as a favorite. 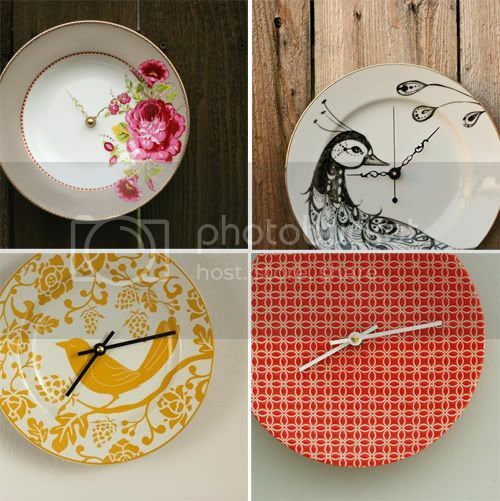 wow, plate wall clocks. it doesn't get much better than that! Congrats, Danni, on the London Times article!!!! Yay! How fun ~~ i love all the birds!! 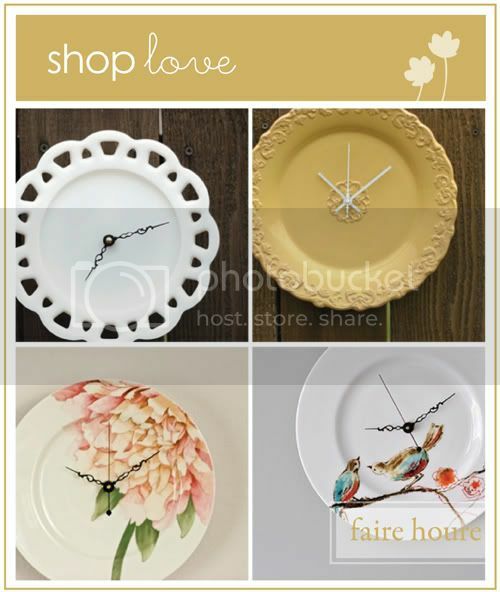 Love all of these clocks! Gorgeous! these clocks are beautiful...i wouldnt be able to decide which one! that is a wonderful story! lovely. and her clocks are gorgeous. I love the floral one and the birdie one in the first photo... so so pretty. Oh they're all so charming in their own way! I love the plates/clocks. And I also love that gold frame in the second to last photograph set! love your blog! Love these clocks!! and congratulations on the mention on Times!! How exciting for you! 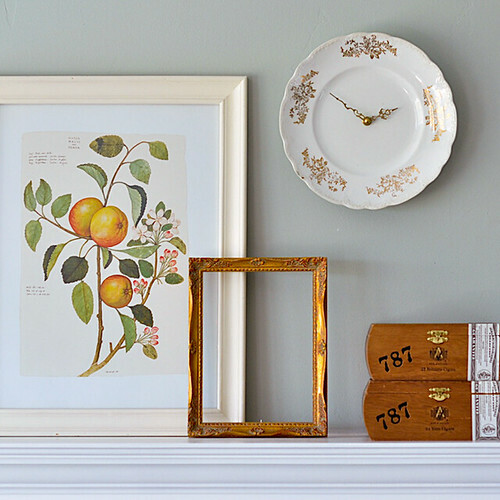 oh my goodness, these clocks are so lovely! i want them all lol:D i love the story behind her shop:) thanks for sharing this w/us! this will definitely make a wonderful gift! Those are some gorgeous clocks. I would love to own one of those someday. I'm so pleased to have discovered your lovely blog and have added you to my blog roll over at Urban Flea. I'd love for you to stop by sometime! I love these! I want to make one for my house. I love plates and this would be a wonderful craft to learn. We just aquired a bunch of old handpainted plates of my mate's mothers (who passed three years ago). this would be a lovely thing to do with them. thanks for the links, I'll go check it out and see what she knows about values and if I should do this to the plates we have.